Fruit Mania is rated 2.1 out of 5 by 24. Rated 4 out of 5 by nagcen from Glitches Love this game, but when I got to the avacado level, a bug could not be killed. I gave up. I will download it again later to see if they fixed the problem. I like the approach of match 3 plus killing bugs. Great combination. Other than that I love it. It's too bad they don't have levels of challenge. That way you can make it work...no matter what abilities you have. Rated 3 out of 5 by shoelesshs from Cute but sluggish This looked to be a cute M3 game, and for the most part, it is. It's your typical M3 game - match fruits and powerups, break chains, turn all the blocks white, etc. Something different here is the bug-fighting challenge. Not too difficult - you make a lot of matches and fireballs shoot at the bugs to kill them. However, if the bug reaches your garden, it turns all you block back to green. And, there are powerups you can earn to combat them easier. You have to earn most of the powerups by matching specific fruits. Some you buy with fruit, some you just get automatically. Having only played an hour, I don't have a lot of detail here, but it's not too difficult to understand. My only complaint is that it runs very sluggish. Don't know if it's my computer or just the way the game runs. It was hard grabbing on to the items to switch them sometimes. You also have to wait for all the chain-reactions to stop before you can start switching fruits again - grrr! I like a little faster play with M3 games. I'm going to recommend this for anyone who wants a cute, not too challenging M3 game, but try it before buying and make sure it runs well for you. Rated 3 out of 5 by BabyWombat from A Bit Of A Fizzer This game had the potential to be much better than it was. Graphics colourful, instructions clear and detailed. No annoying music. 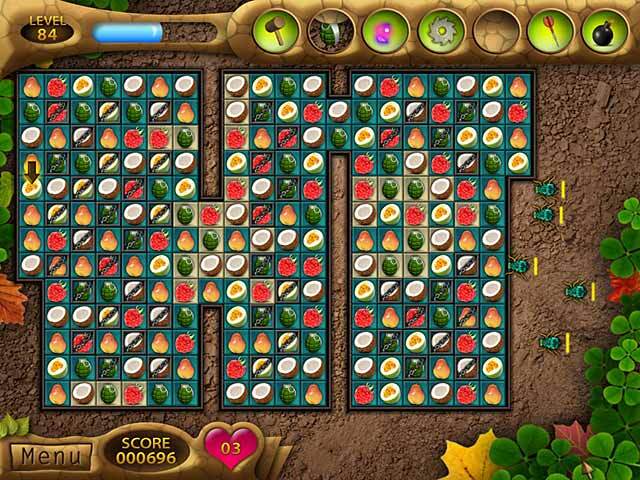 Storyline basic - match 3 of the specified type of fruit (to plant a garden) and don't let the bugs get them. Fairly straightforward match 3 varieties - chains, complex layouts etc. 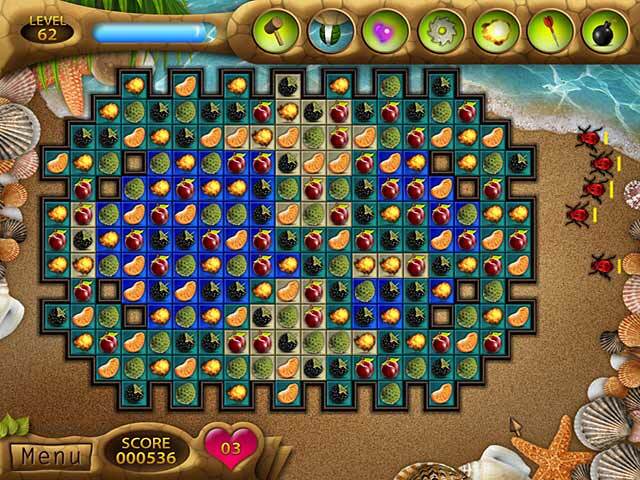 Earn powerups through matching the specified number of different types of fruit. The big downer is the implementation of the match cascading. As a previous reviewer stated you have to wait for all the matches to complete cascading before your next move. A real problem in timed mode or for eliminating the bugs before they get the fruit. Fun for an hour but I wouldn't buy this one. Rated 3 out of 5 by duckgirl65 from Not Quite Right This game has the potential to be a cute, mindless Match 3, but it is programmed with one of my biggest pet peeves for a Match 3, you cannot make another move until all cascading is finished, which eats up a considerable amount of time playing against a clock. Based on that alone, I will not buy this game. 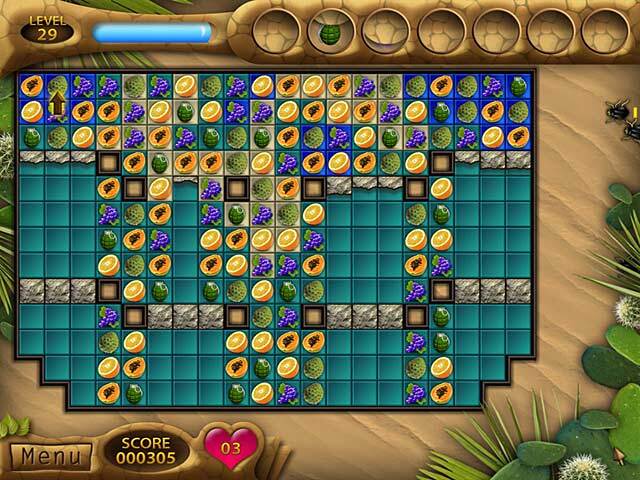 Rated 2 out of 5 by linpearl25 from fruit mania I have played this game over & over again, but I have not won the game yet. any hints on how to win, would be appreciated. 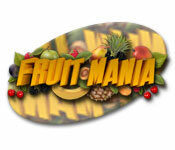 Rated 2 out of 5 by hhall10251 from Fruit Mania Only played this game for 10 minutes and was bored the whole time. No challenge, no fun. Come on BF surely there are better games out there than this. My 7 yr. old even said what a boring game.